Howard Wong - Writer: After the Cape Vol 2: All Falls Down Trade Paperback Out Now! 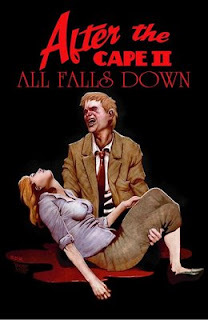 After the Cape Vol 2: All Falls Down Trade Paperback Out Now! Run to your shops and grab a copy! For those who can't wait, I defaced a few at Paradise Comics. I'll also have copies at the Paradise Toronto Comicon as well. How far can one man fall? How long does it take before ones bad life choices reap their consequences? Just when he thought things couldn’t get any worse…they do! And Ethan Falls, former hero, loses the one thing that was more important to him than life itself. Collecting the second hit mini-series After the Cape II, plus tons of extras, this is a MUST-READ book!